B401, Certan is the only product available for the treatment of wax moth. Used after the honey harvest, just before the frames are stored, it will give 100% protection right through to the following season. One 120ml bottle can treat 10 National supers (120 frames). To use, B401 must be diluted in water, 1 volume of B401 to 19 volumes of water and it must be applied with a sprayer. Before mixing shake the bottle well and measure out the required amount. 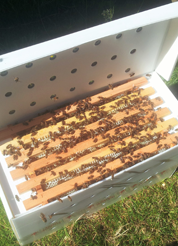 10ml of B401 mixed in 200ml of water can treat 9-11 national frames or 7 langstroth frames. The mixed solution must be used the same day . When diluted spray each frame evenly on both sides. Allow the frames to dry before storing.